Hanoi (VNA) – Hospitals across Hanoi are at full capacity treating dengue fever patients. Since the beginning of this year, Vietnam has recorded more than 71,000 dengue fever cases, with some 60,000 people hospitalised, a year-on-year increase of 24.8 percent. Hanoi alone has reported about 8,000 cases. Due to the disease’s spread, most of Hanoi’s leading hospitals are overloaded. The National Hospital of Tropical Diseases treats hundreds of people with dengue fever symptoms every day, forcing its medical staff to work earlier and through weekends to fight the epidemic. The hospital also established a care centre during daytime in its hall to reduce overloading. The centre, equipped with 20 beds, aims to serve patients from Hanoi who need daytime treatment before returning home in the evening. 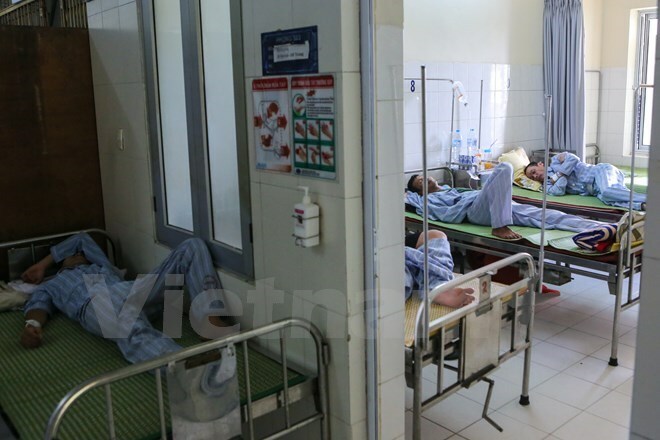 Director of the hospital Nguyen Van Kinh predicts that the situation will continue due to abnormal weather and the increase of dengue patients in Hanoi. Dong Da Hospital is also overloaded, serving 400-500 dengue patients daily, about 20 percent of whom hospitalised. It has to arrange more space for dengue treatment, even in doctors’ workrooms. Additionally, Thanh Nhan hospital receives some 300 patients with dengue fever every day. The Health Ministry urged localities to continue implementing recommendations on dengue prevention and control which include destroying habitats where mosquitoes breed, ensuring a clean living environment, using mosquito repellents and wearing long-sleeved shirts and pants..
Dengue fever is a viral infection transmitted by the bite of an infected mosquito. There is no specific treatment for dengue and vaccination options are limited.